Here’s what I did to replace it. 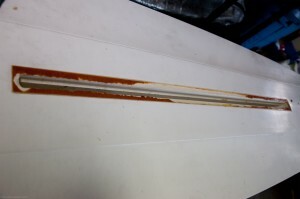 I tried a few gasket solutions that failed: a full mylar gasket, which was too stiff at the front and could not stretch enough to accommodate the daggerboard when extended, and then a rubber gasket, which wasn’t stiff enough to do a good job of keeping water out of the daggerboard well. I also tried a few adhesives on the job: first a couple of contact cement variants, which weren’t strong enough, and then classic Krazy Glue, which was. The solution I finally settled on was a hybrid gasket, rubber up front, and mylar for the stern half. I cut the rubber from some 1/16″ thick rubber sheet that I had lying around, and the mylar (actually cloth-backed mylar) I cut from some tape that I had ordered from Annapolis Sailing http://www.apsltd.com/. 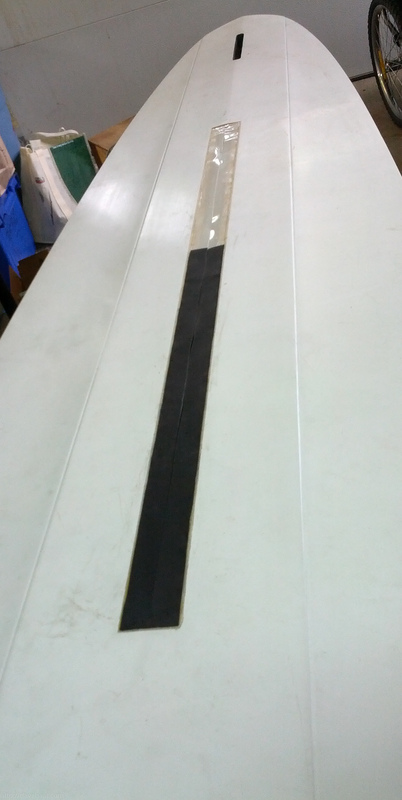 For the daggerboard slot, I cut a lengthwise slit in both the rubber and the mylar. I overlapped the rubber over the mylar for about 3 inches mid-length in the well. It turned out pretty well. The stern section is pretty stiff, which suits high speed reaching, but the front section is flexible enough to allow the daggerboard to extend fully. Here is a picture of the final result. Now for some serious on-the-water testing. Nice job, thanks for sharing. How has it held out? How did you prep the surface before applying the glue? You’re welcome. It’s still intact after 3 seasons of light use -no problems so far.